Born in Barcelona in 1861. 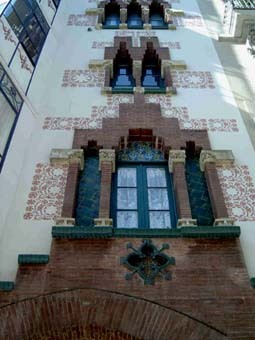 Graduated from the School of Architecture of Barcelona – of which he was later a professor – in the year 1885. He collaborated intensely with Lluís Domènech i Montaner, with whom he carried out works such as the “Castell dels tres dragons” (The castle of the three dragons) at the present Museum of Zoology in Barcelona, where he was responsible for the workshop, the Palau de la Música Catalana (Catalonian Music Palace) and other buildings. 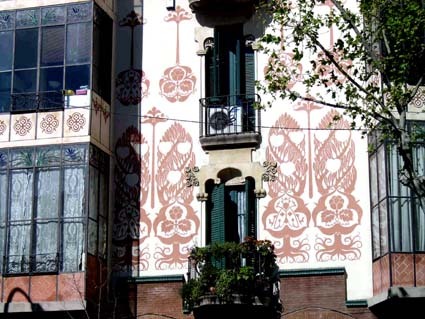 Also he collaborated with other important architects of his era such as Elies Rogent and Josep Maria Jujol. 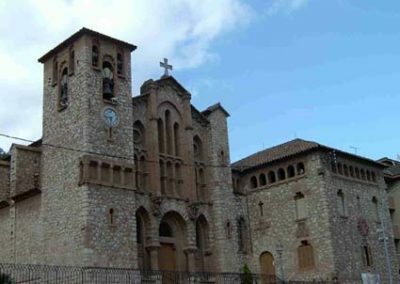 The architecture of Gallissà is characterized for a new personal style based in the past of the national Catalan architecture and especially in the rural style of the ancestral houses and the “masias” (typical rural house of Catalonia). 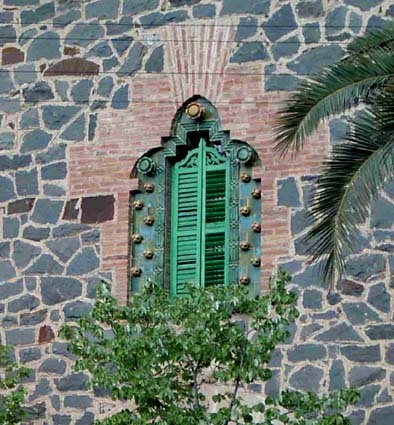 In the Manel Llopis House in Barcelona, the Arabic influence is also visible. As with many of the artists of the period, he also became involved in political activity within the field of Catalanism, participating in the edition of the “Bases of Manresa”, a document in which the national Catalonian demands were collected during the period of the Renaixença (a XIXth century period with a strong recovery of Catalan national arts and culture), from his position as president of the “Unió Catalanista” (a Catalanist conservative political party). Antoni Maria Gallissà died in Barcelona at the age of 42 years, the year 1903, ending a brilliant career with a very interesting body of work already carried out, and the expectation of further brilliant executions to come. This was the main activity and he developed it, following the plans of his master Lluís Domènech i Montaner, by combining a very refined technique with an exhaustive taste for decoration. 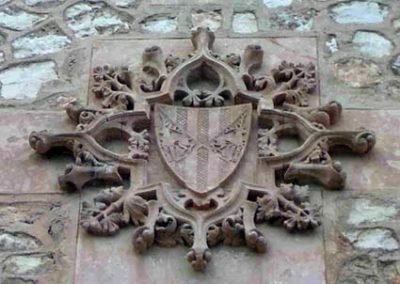 He took advantage of this aspect to reafirm the national spirit of Catalonia, in line with what his teacher had marked with his essay “En busca d’una arquitectura nacional” (In search of a national – Catalan – architecture). Gallissà dedicated a significant effort to the design of other aspects of his work that were not exclusively architectural. Because of this he is also known by his designs of furniture, ornamentation, mosaics, sgraffito’s and other themes far removed from the architecture itself, such as the design for flags and banners, and historic writings and research, etc. Inside this chapter we see a series of important works by him, such as the ornamental street lamps of Carrer Ferran in Barcelona, wich he carried out in 1902 – a year before his death – and wich were inspired by designs on medieval floor tiles, of wich he was also a collector. The design of the banner of the Orfeó Català (The most important Catalan Choral society) is his work also. 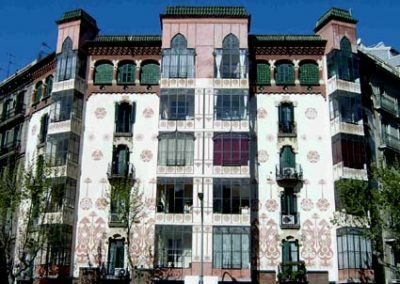 In the year 1902, Gallissà planned a façade of a great simplicity and elegance for this building. 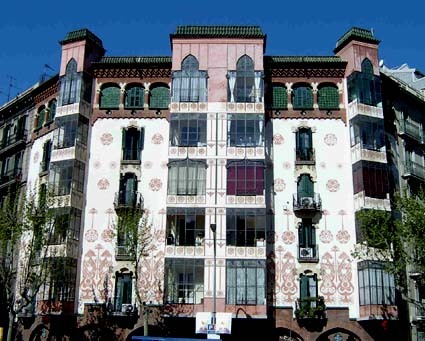 It combines the use of the brick on the ground floor and the galleries that crown the building, with areas of white cement adorned with sgraffito’s by Jujol, wich decorate the most spectacular parts of the façade. 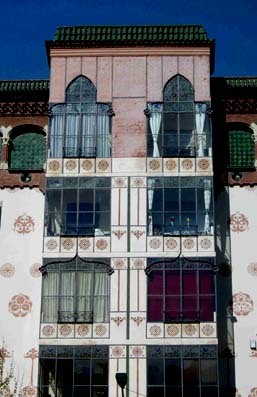 The three vertical lines of galleries are finished in their upper parts with turrets rising above the roof line, wich are decorated in a neo-mudèjar style (some of their decorative elements were eliminated as a result of damage suffered in bombardments during the Spanish civil war of 1936-39). 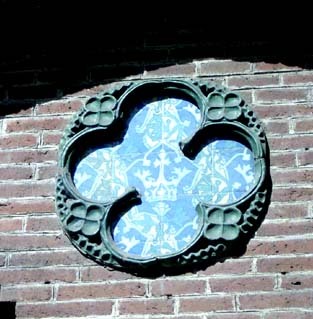 Ceramics are extensively used in different places of the façade, such as for the medallions in the form of trefoils and the tiles under the bases of the tribunes. These ceramics pieces were drawn by Gallissà and executed by the artesans Pujol i Bausis. 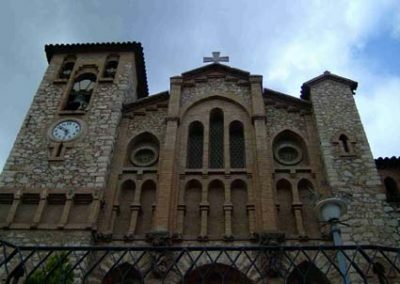 Church of Gothic inspiration with an exterior combining brick with stone, and a main façade built on two well differentiated levels. In the interior the naves are divided by arches carried out in brick combined with ceramic elements. The project of the church was carried out jointly by Gallissà and by Josep Font i Gumà. 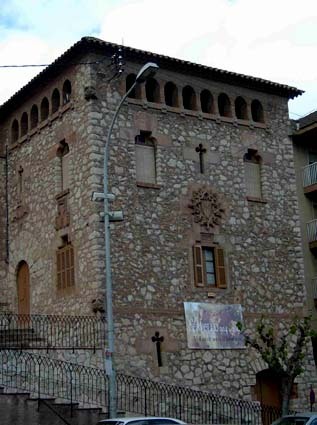 The parish house of Cervelló presents a very austere aspect. It was carried out basically with stone and with some applications of brick over the windows and around the upper gallery. 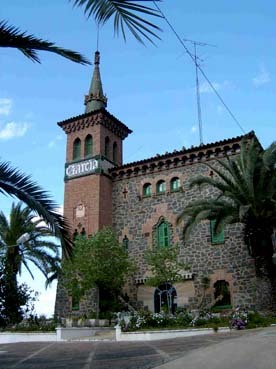 The house show various Gothic elements, typical Catalan Art Nouveau stepped windows, a Romanesque main door and as more important decorative element, a spectacular Cervelló coat of arms. 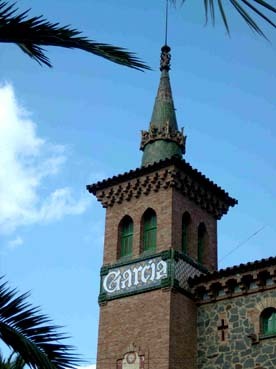 The Garcia Farm was entrusted to Gallissà by the cement manufacturer Frederic Garcia, in the year 1899 (other sources attribute the project to the architect Josep Font i Gumà who collaborated with Gallissà on the construction of the church of Sant Esteve in the same village (see up). 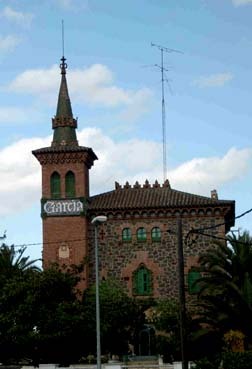 Gallissà was inspired by the traditional ancestral Catalonian architecture to design a building that is characterized by the simplicity of its square plan broken only by the beautiful tower in brick, with its conical structure covered with green glazed ceramics to great effect, and surrounded by a crown. 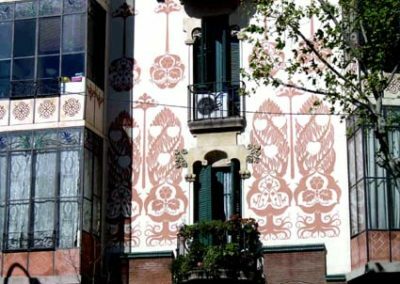 The two main façades in slate are decorated with Art Nouveau motives of great brightness. Some original furniture is conserved in the building’s upper levels.